Some of my favorite experiences while traveling are encounters with wild animals, especially when these are unexpected. To stumble on extremely rare birds while traveling the roads of Hawaii was a treat! My wife and I recently finished a fun week in Maui, one day of which was a trip to the summit of the dormant volcano, Haleakala, which occupies more than half the island’s land mass. As we were driving up the mountain, we saw two pair of nene eating grass beside the road, enjoying the mist and drizzle on the mountain. 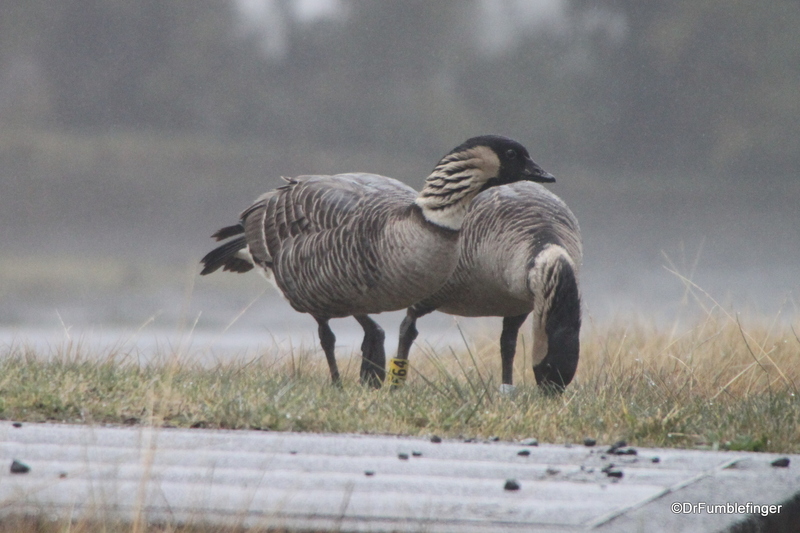 If you look carefully on an enlargement of the photo (below), you’ll see water beading on the nene’s back. Hawaii’s great volcanoes (Volcanoes National Park on the Big Island and Haleakala National Park on Maui) completely fascinate me and are the kind of place I can visit again and again. These parks are among the only places on the planet where you’ll find the Nene, Hawaii’s state bird. While they vaguely resemble Canada geese, they are smaller, have a different pattern of coloration and have become adapted to walking on rough lava surfaces, their feet having partially lost their webbing. I first heard of the Nene when completing cross-word puzzles in college, where it is a common clue (4 letter word for “Hawaiian goose”). The Nene was originally far-ranging on the Hawaiian islands, with over 25,000 estimated to have lived on the islands. By the 1950s only 50 Nene remained due to a combination of feral animals, habitat destruction and car accidents (they have no fear of vehicles and don’t scamper away from an oncoming car). 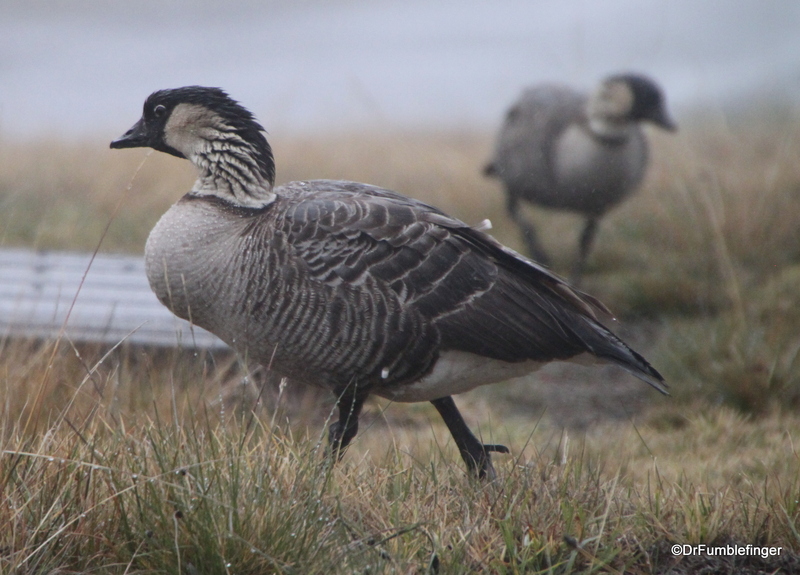 The Nene’s future was uncertain but conservation efforts have been very successful and today around 2000 survive. They are being reintroduced on Molokai and other parks in Hawaii so one can be optimistic about their survival. The rarest bird I ever saw was a pickled extinct dodo bird in a monastery in Prague. About 15 years ago I saw a massive California Condor flying about 300 m over my home when I lived in Ventura county. I did not have a chance to get a photo, but enjoyed it’s stealth bomber like size as it gracefully glided on the thermals. Only about 100 of these birds survive and the condor’s future is far less certain than the Nene’s. Nice photos, it was an exciting moment! It was nice to see them, but not as surprising as to see two Nene waddle across the darkened road in front of us as we drove back from the summit, having viewed a memorable sunset.